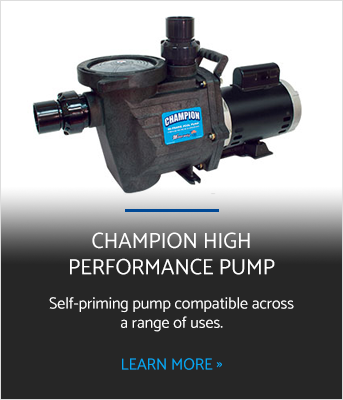 The Champion High Performance Pump is a self-priming pump compatible with all cleaning systems, various filters and jet action spas, and pools. The Champion Pump is ideal for new installations and as a replacement pump due to its dimensions. We have a modified version for light to medium commercial and industrial use in pumping chemicals or chemical solutions as a superior drop in replacement for a Pacer pump.